This fantastic New Era Captain America Shield cap is a great way to show your support to the astounding Marvel comic. 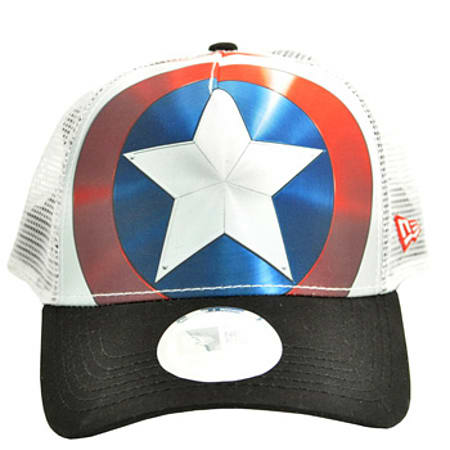 The design featured on the front of the hat features the design on the famous shield that has become a crucial part of Captain America's image. The New Era Captain America Shield cap is a fantastic item that will definitely be a welcome addition to any outfit that you have in your collection. With this New Era Captain America Shield cap, you are instantly informing people of what you are interested in, allowing people to know what to talk to you about. The striking colours featured on the trucker hat will help you to stand out, even if the design doesn't catch on. The New Era Captain America Shield cap can instantly show people whether or not you share their interests, giving you the chance to make more friends. 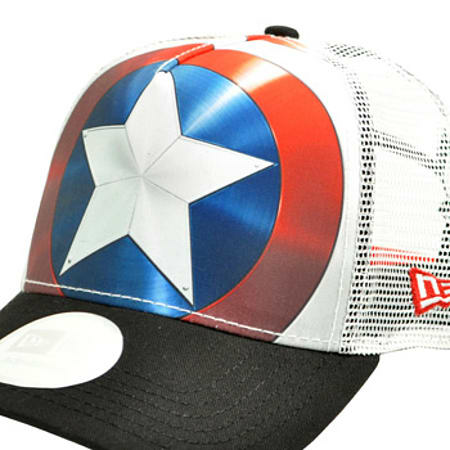 If you are looking for a hat that is perfect for summer, both in practicality and style then this New Era Captain America Shield cap is definitely the item for you. The netting at the back of the head will give your head some air while the cap protects your face from the sun. This New Era Captain America Shield cap is certainly worth every penny, and will allow you to experiment with numerous styles.